﻿ A new punk band based in Watford that doesn’t feature a member of Gallows would honestly be more surprising than one that does at this point. That’s far from a bad thing though, as pretty much every act associated with Gallows, be that through a member lending their talents to the band or finding their feet on Venn Records, has been fantastic. It leaves a lot of hope for Funeral Shakes then, this time featuring Lee Barratt on drums and rounded out by members of Nervus and The Smoking Hearts, yet more incredibly high indications of quality that puts this self-titled debut in good stead to be some truly special. So imagine the disappointment when, on the first spin, it doesn’t seem to be anything like that. It feels ultimately functional and exactly what a punk album drawing from Weezer and Rocket From The Crypt should sound like, but for an album that initially heralded so much promise, Funeral Shakes leave a surprisingly cold first impression. As for each subsequent listen, however, Funeral Shakes manage to click more and more into gear, and their debut becomes the rare straightforward punk album where a passive listen offers far less than one that’s more intensive. 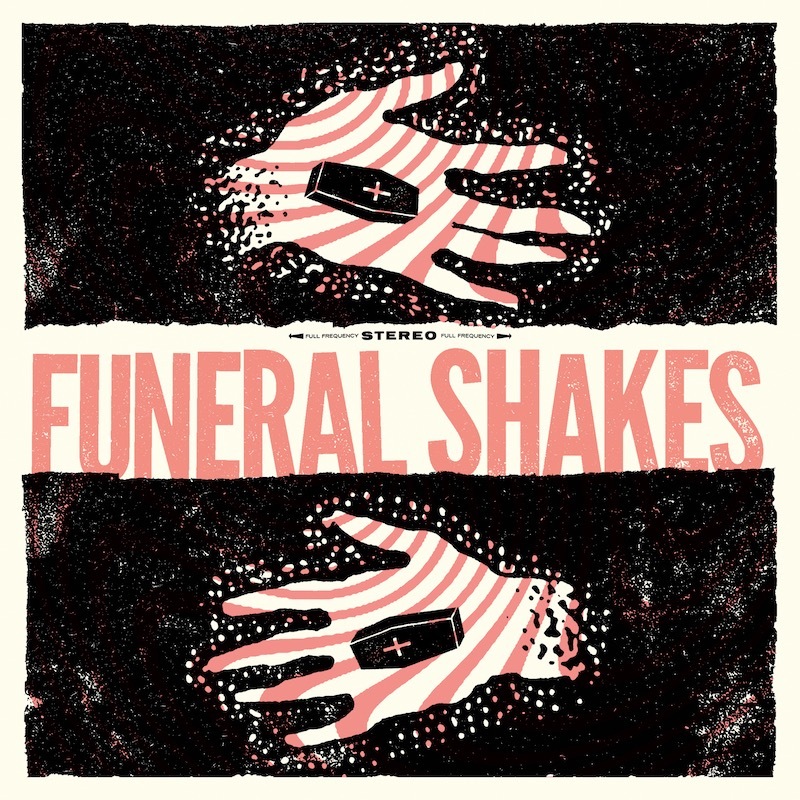 There mightn’t be many hidden intricacies to suss out, and there’s a bit of variety lacking for a twelve-track album that might make it burn a little brighter, but for an album that channels its gumption into the biggest of melodies and hooks, Funeral Shakes get the job done. It helps in this case that Funeral Shakes aren’t concerned in the slightest with being flashy or putting on airs to court the higher-ups, and instead opt for a no-frills approach to punk glazed with slight touches of old-school rock ‘n’ roll for good measure. It’s not entirely visible, mainly providing the rich melodic backbone for tracks like Lightning and the utterly glorious Gold Teeth, but in the surf-rock interlude of Gin Palace and the full-blown doo-wop of closer You’re So Bad, it hints at doors opening that would definitely be worth Funeral Shakes exploring in the future, given that they make for the most interest moments on the entire album. The punk ‘n’ roll sound is great, especially with a little more aggro spice like on Over You and Bon Voyage, but there’s not a lot that can really be done with it, and on some of the less-memorable cuts, it really does feel like retreading old ground that’s done better elsewhere. The same could arguably said about the lyrics too, except on a wider scale, essentially a collection of dejected shouts circling a particularly bitter breakup. And while that’s a valid point, especially considering it’s the focal point of essentially the entire album, Funeral Shakes have two major advantages in this department, both attributed to bassist and vocalist Calvin Rossey. For one, there’s no shortage of grit and snotty British bile, and when injected into a track like Over You, it lends itself to a particularly fiery performance that really does justice to an overtly punk spark. The second is an abundance of cockiness that manifests in a vocal drawl that might be a bit too unrefined for some to take, but with the veritable side-eye that runs all throughout Lovebirds that feels so constantly pleased with itself without being insufferable, it’s safe to say that it works. Granted, the comparatively naked vulnerability of The Motions may break the narrative somewhat, but when Funeral Shakes are as laser-focused in terms of the quality of their melodies as they are, it’s not exactly difficult to look past. It all comes together for an album that’s rather small-scale and definitely feels like the work of a side-project, but there’s enough talent within Funeral Shakes to make a punchy, rather lowkey album turn into an enjoyable listen regardless. Even if it does take a bit of time to get into fully, there’s enough zeal that reveals itself to make sure that it sticks, and in turn, Funeral Shakes end up delivering on all fronts, particularly with some killer pop sensibilities. Anyone could do a lot worse than giving this a few listens, and even if it requires a bit of patience to fully get going, it’s worth it in the end. ‘Funeral Shakes’ by Funeral Shakes is released on 16th February on Silent Cult Records.